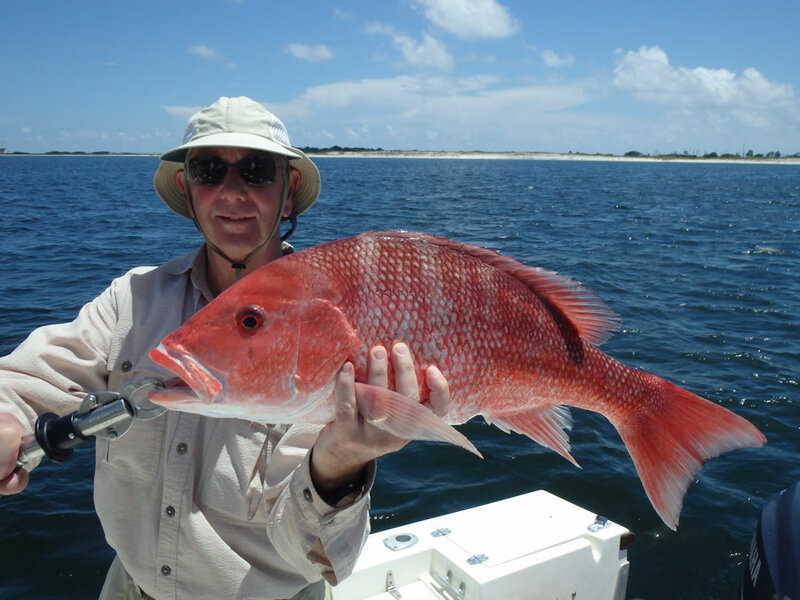 Summer 2014 arrived with red snapper season in full swing and rapidly clearing waters in Santa Rosa Sound. 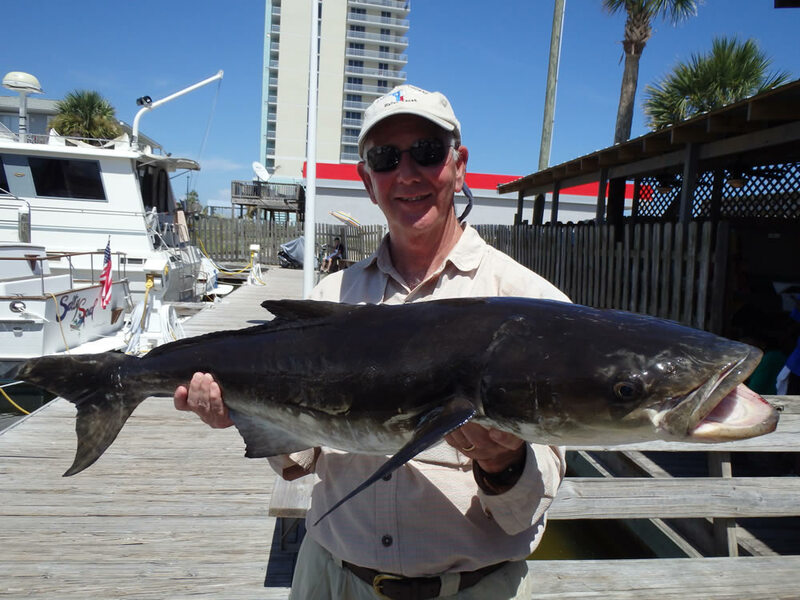 Our bottom-fishing clients had a blast with the snappers and an occasional cobia on near-shore and inshore structure. 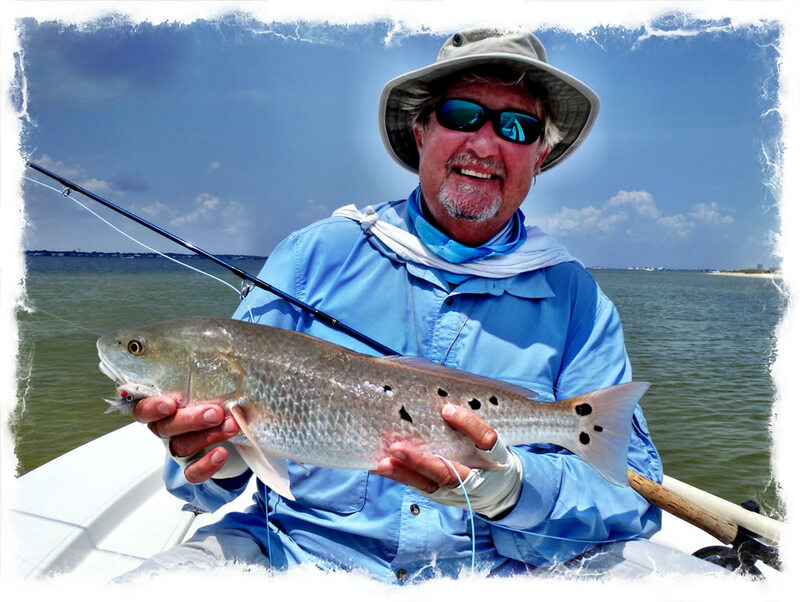 By July the waters of Santa Rosa Sound became clear enough for sight-fishing, and our fly clients experienced the thrill of stalking redfish and speckled trout on the shallow flats. 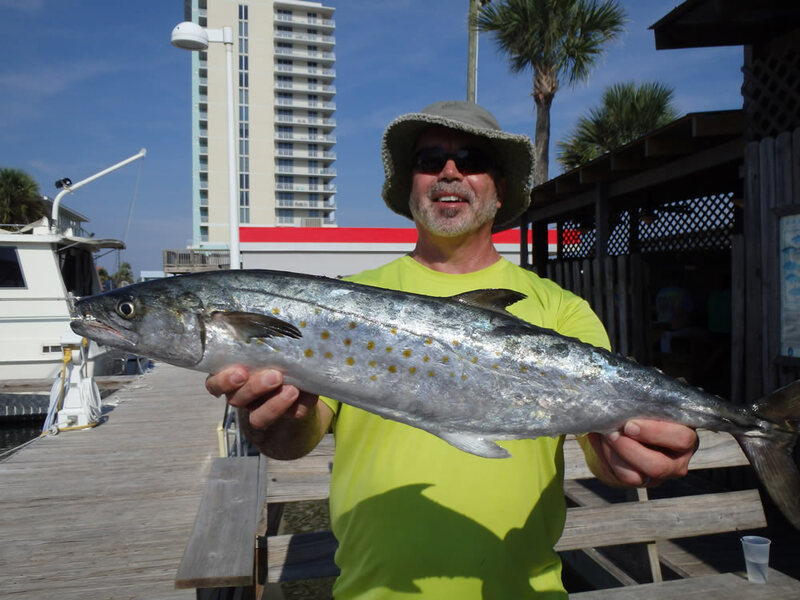 There were smaller than usual numbers of Spanish mackerel and jack crevalle in the inland waters due to the April 30 flood that trashed the water for about ten weeks, but our fly and spin anglers were able to land decent numbers of both species. Here are the photos from the summer season. Double-click on the thumbnails for full-screen photos. 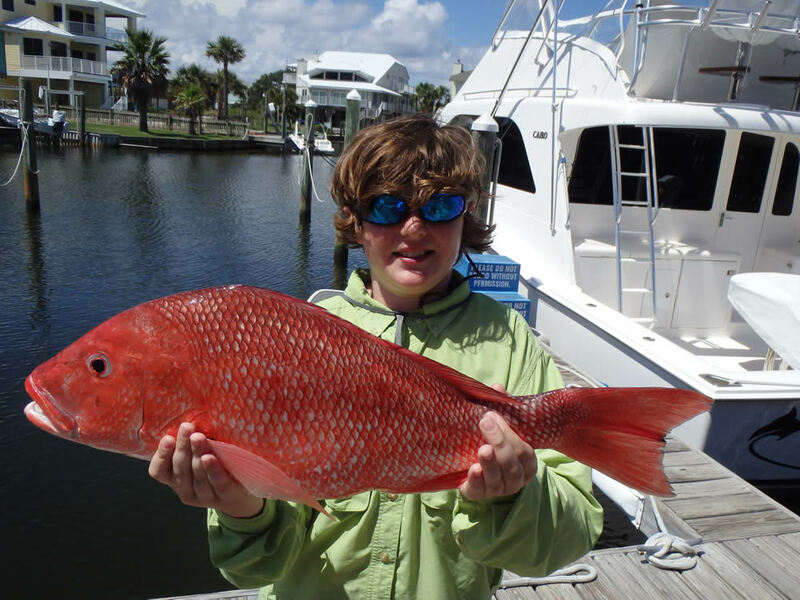 For photos from previous seasons, click on the links to these additional galleries: Spring 2014, Winter 2014, :Fall 2013, Summer 2013, Spring 2013, Winter 2013, Fall 2012, Spring 2012, Winter 2012, Fall 2011, Summer 2011, Spring 2011, Winter 2011, Fall 2010, Summer 2010, Spring 2010, Winter 2010, Fall 2009,Summer 2009, Spring 2009, Winter 2009, Fall 2008, Summer 2008, Spring 2008, Winter 2008, Fall 2007, Summer 2007, Spring 2007, Winter 2007, Fall 2006, Summer 2006, Spring 2006, Winter 2006, Spring 2005, Summer 2005, Fall 2005. Use the back button on your browser to return to this page. 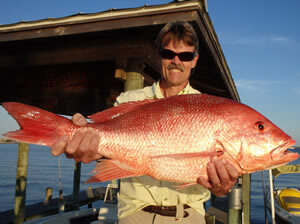 Marlin Johnson opens up the summer gallery on June 21 with a nice red snapper headed for the cooler. We had a long (7 week) snapper season with plenty of fish, and all of our bottom-fishing clients took fillets home for dinner. 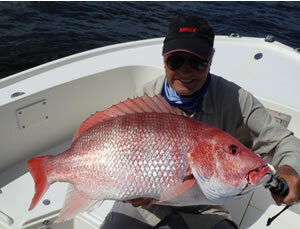 Patti Heacock had her hands full June 29 with this monster snapper on spinning tackle. 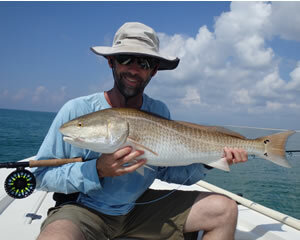 We fished this spot first thing that morning, and there hadn't been much going on. 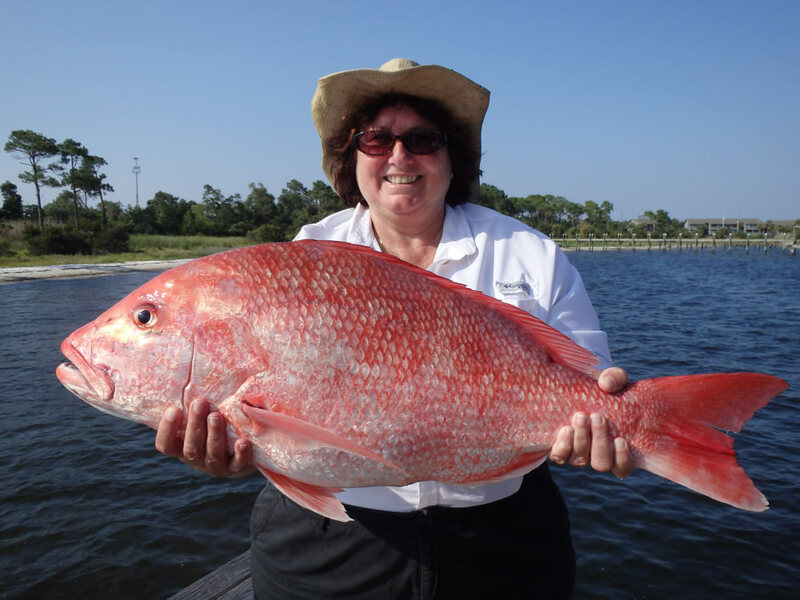 On our way back in we gave it one more shot, and Patti hit the jackpot. 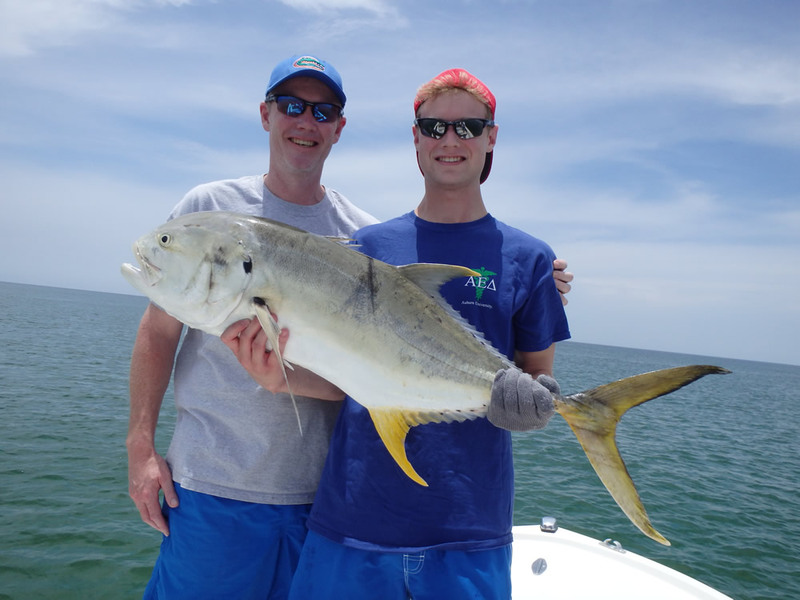 Brandon Honeywell landed the fish of the day on July 3...a hard-fighting jack crevalle. 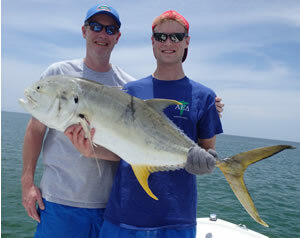 Nice shot of Brandon and his dad Mike Honeywell. That afternoon we took the family out in Pensacola Bay for some late-afternoon red snapper fishing, and the bite was on fire! 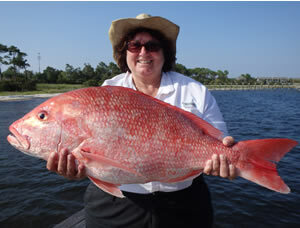 The 7 snappers we kept weighed 65 pounds...not bad for a couple hours fishing. 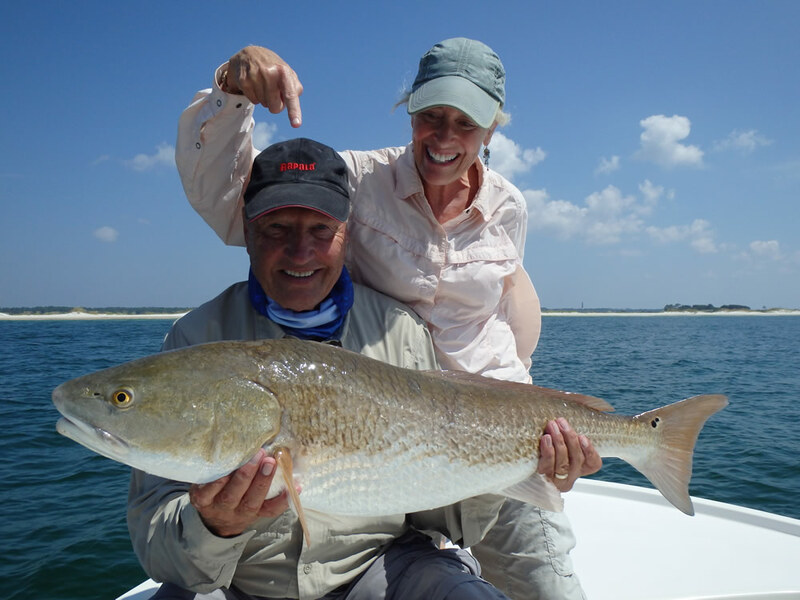 Here's cousin Carol Wakefield with one of the "magnificent seven". 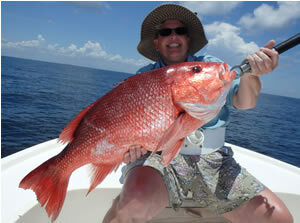 Cousin Michael Wallace Wakefield with his biggest fish of the trip...a 16 pounder. 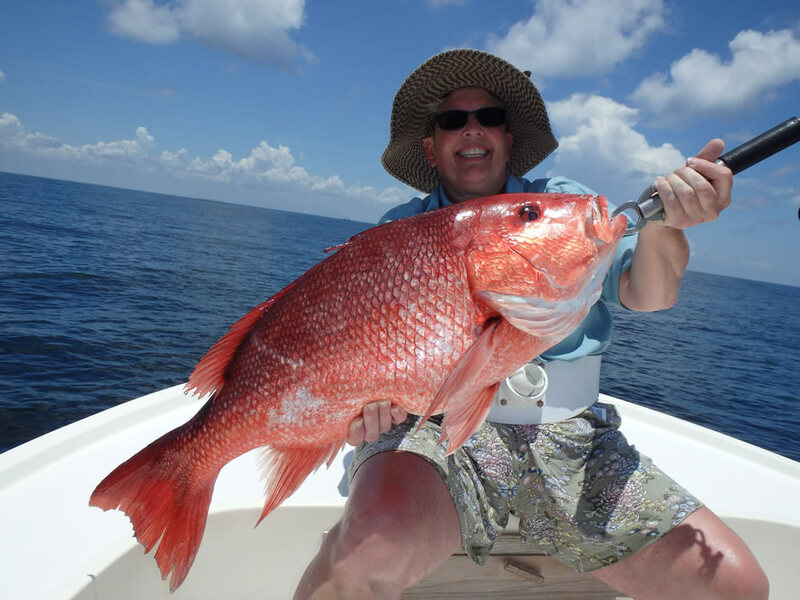 Brother Dave Yelverton with a fine 15 pound snapper. 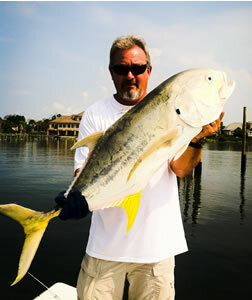 Captain Tim Yelverton with a ten pound fish. 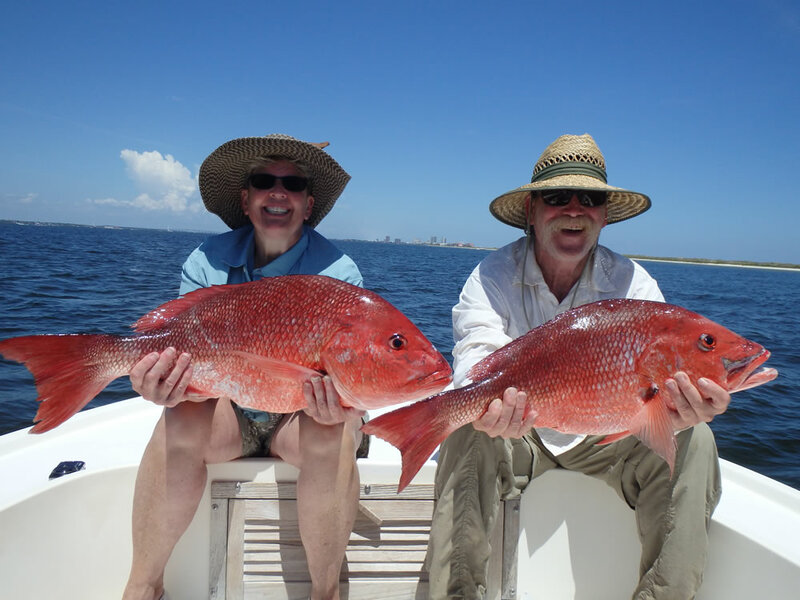 It was great to have family on the boat to experience the all-time best day of red snapper fishing in Pensacola Bay. Robert Buckwalter and Jamie Glass came to town July 6. 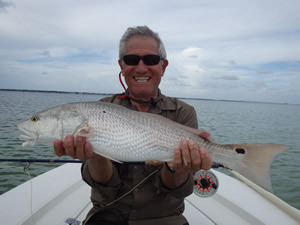 Robert was intent on catching a redfish on fly which he did when this fish nailed an EP baitfish. 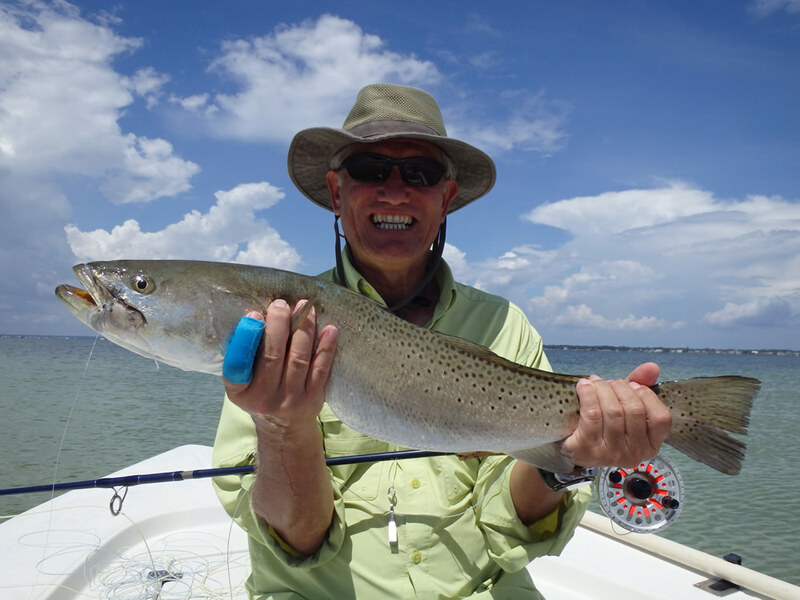 Petroleum Engineer Jamie Glass (aka: "Sparkle") with a fine speckled trout taken on ultralight spinning tackle and a topwater mirrolure. 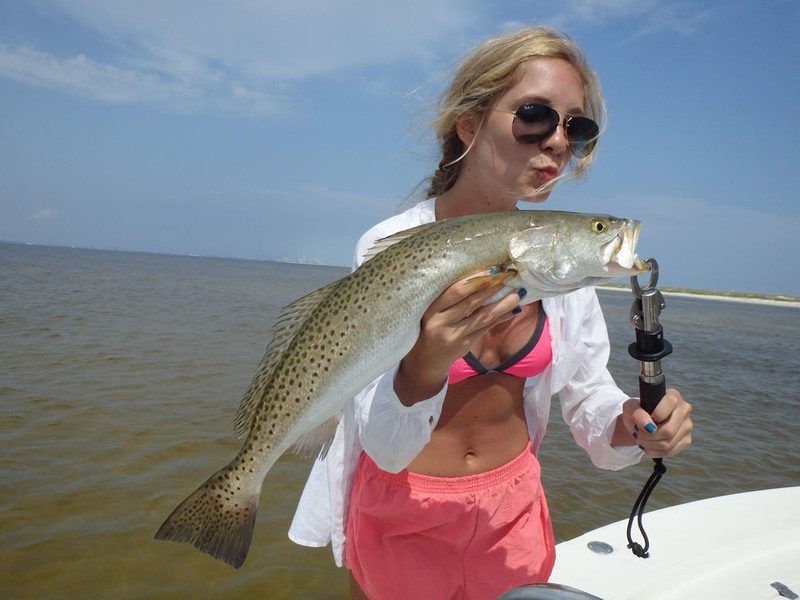 Double click for Jamie's goodbye kiss just before releasing the fish. 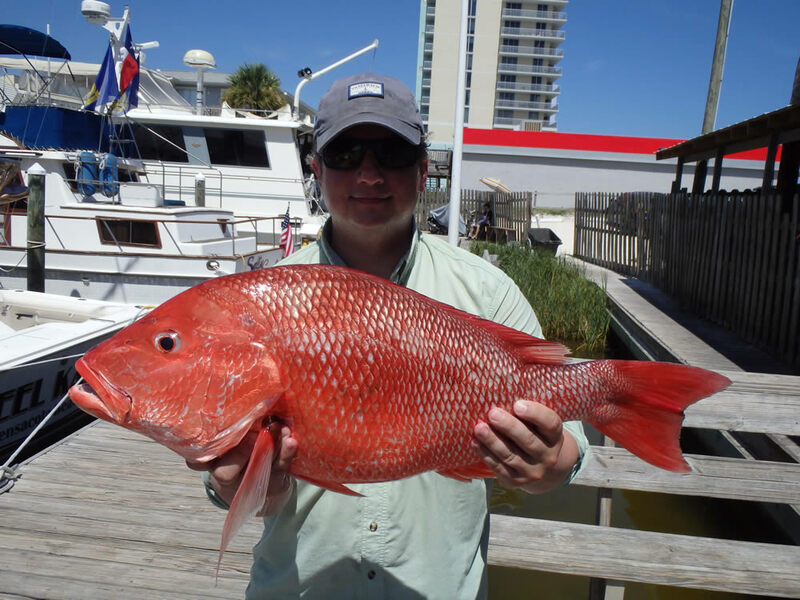 July 8 was another big day for snapper fishing in Pensacola Bay. 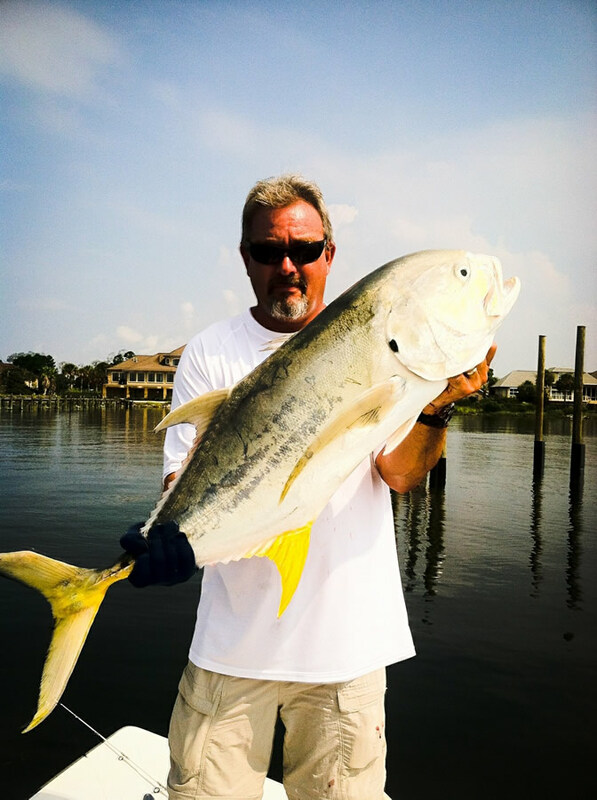 Here's PJ Whitehurst back at the dock with a beauty. 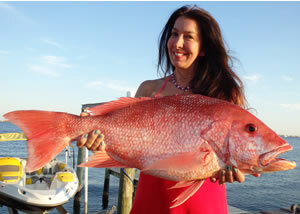 But the "fish of the day" went to PJ's mom Te Carlucci with this 16 pounder. 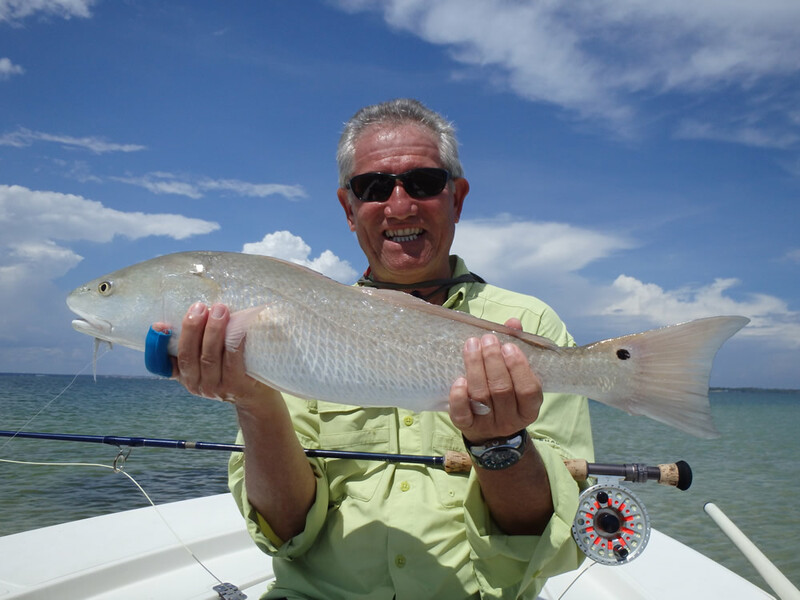 Great shot of high school classmate Dale Smith with his first redfish on fly landed July 11 right in the middle of the Blue Angels air show. 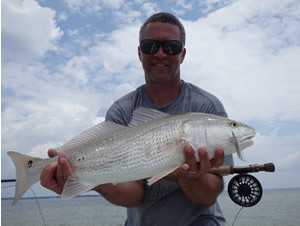 After letting the fly sink to the bottom Dale used a l-o-n-g strip to coax this wary redfish to eat the fly. Nice job, Dale! Double click for a cool effect on the full-screen photo. 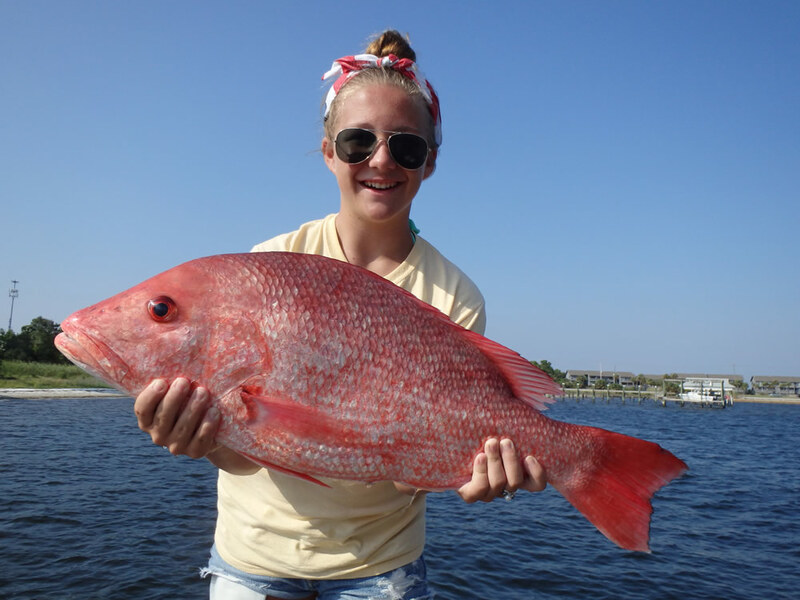 The Goodman clan was in town mid-July and wanted to bottom-fish for their first outing on July 14. 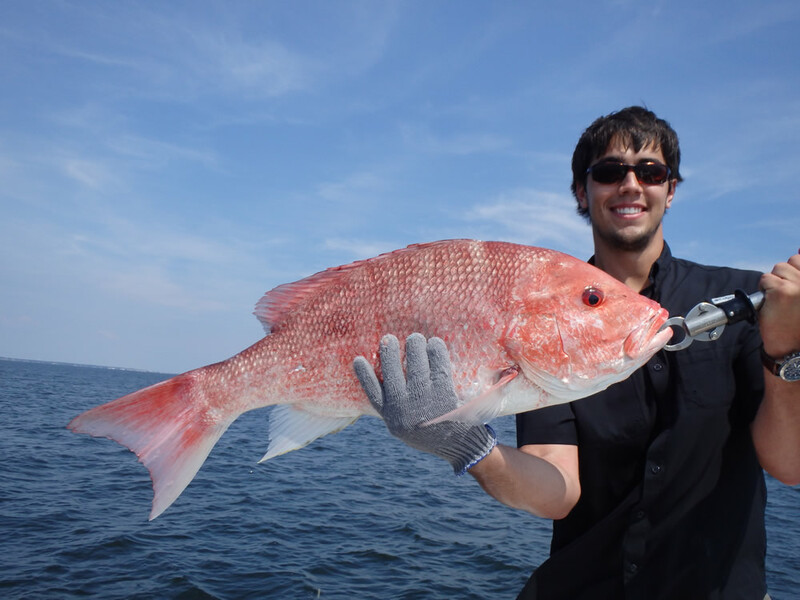 They ended up with enough fish for the week including this gorgeous red snapper caught by Gray Overstreet. And Malcolm Goodman added yet another to the day's take. 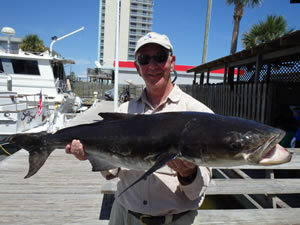 But the surprise bonus fish of the day was this bad-to-the-bone cobia that Malcolm landed on his snapper outfit. 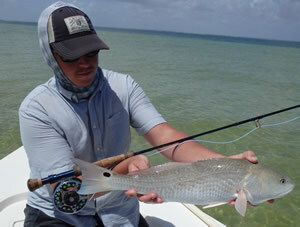 A couple days later David Goodman and his dad Malcolm were in the mood for some shallow-water sight-fishing on fly. 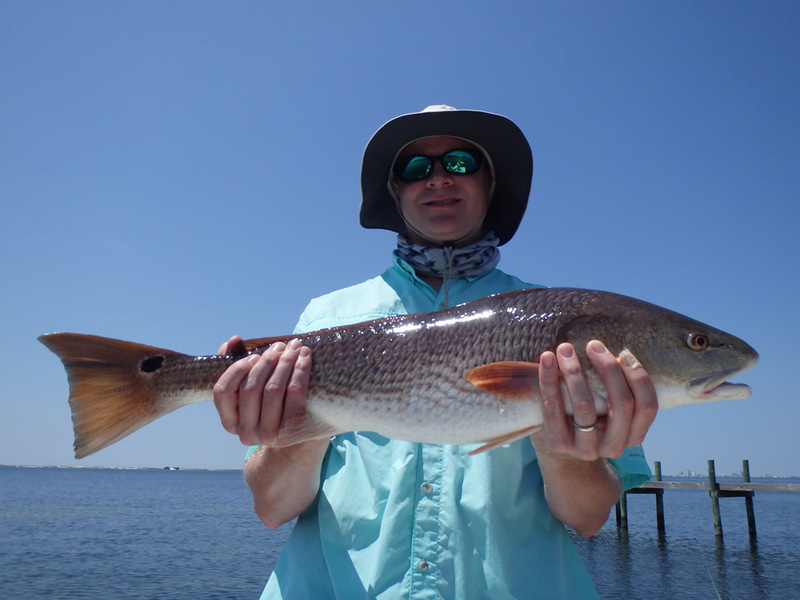 Here's David with his first redfish of the day caught on an EP baitfish pattern and released unharmed. 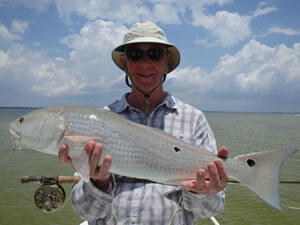 Malcolm followed suit with another picture-perfect redfish landed on the same fly. 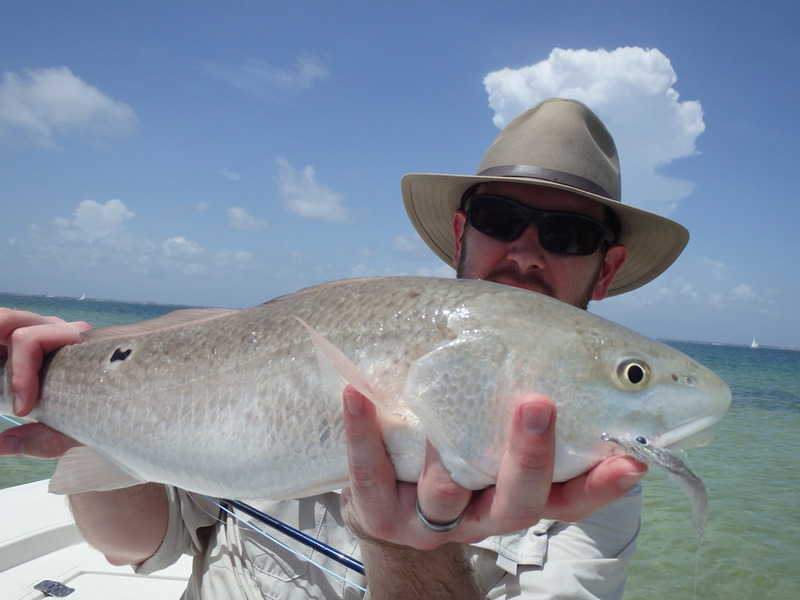 We poled the shallows until we found some fish and then "staked out" waiting for the fish to come to us. 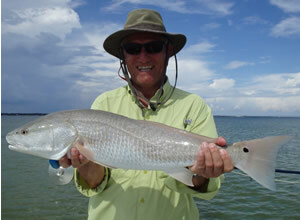 Patience paid off as usual, and both David and Malcolm watched the unsuspecting redfish charge and eat the fly. 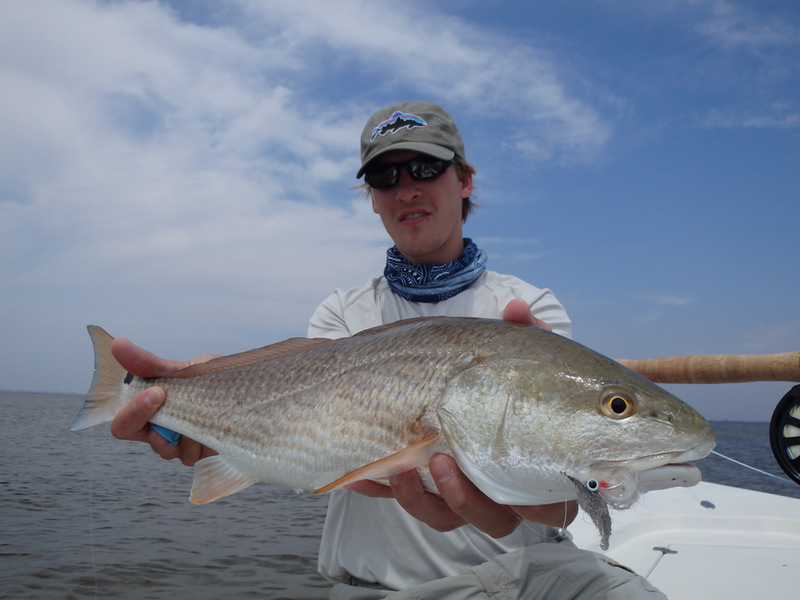 We release all the redfish we catch on fly. 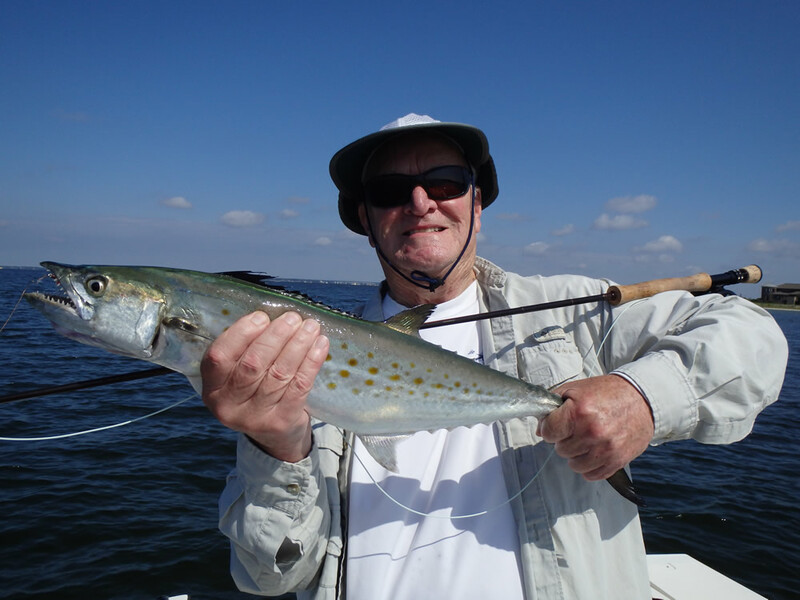 Once again Malcolm landed a bonus fish. 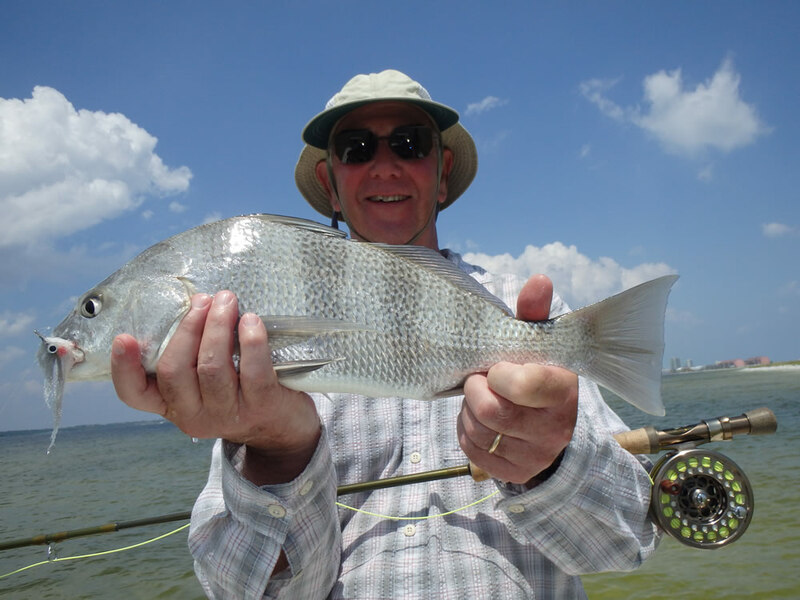 This time it was a black drum on the EP baitfish. 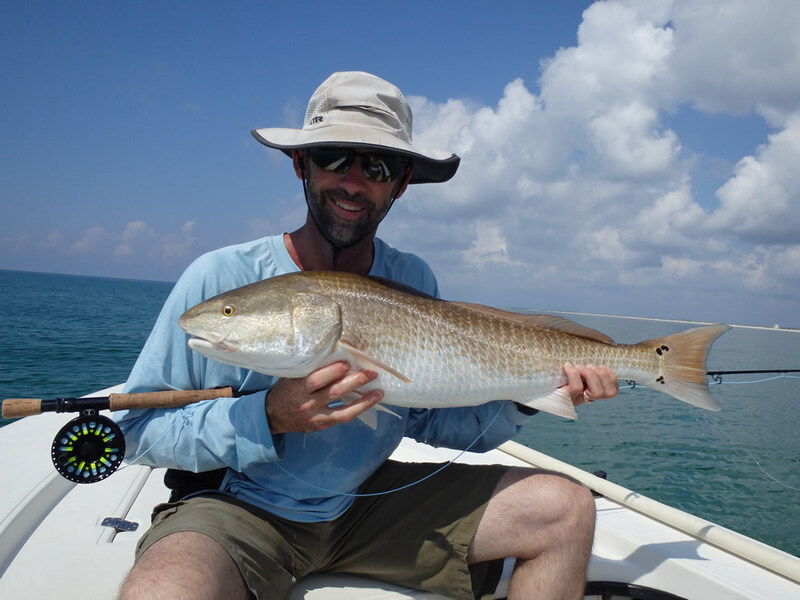 Charlie Grimes landed this slot-sized redfish July 30 while free-drifting a live shrimp around shallow structure in Santa Rosa Sound. 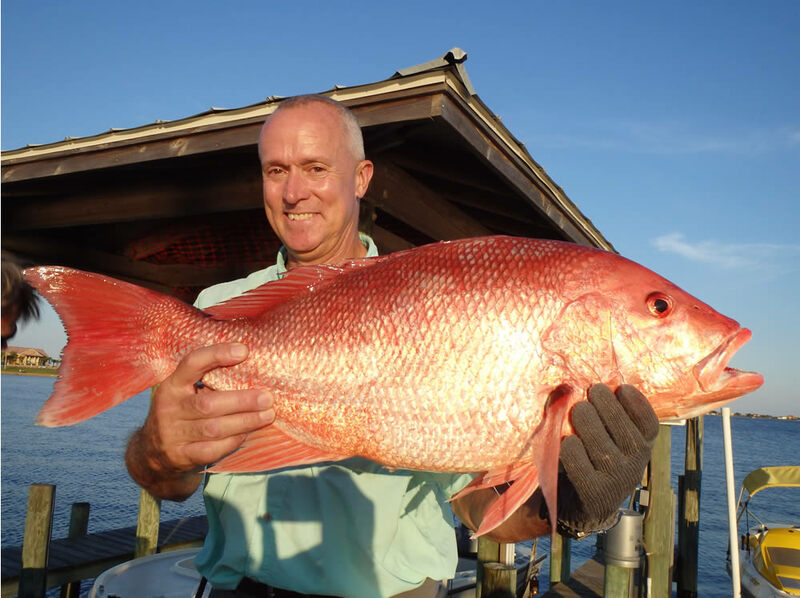 This fish went into the cooler and Charlie and his fishing partner Lou Zarrilli grilled it on the "half shell" that night. 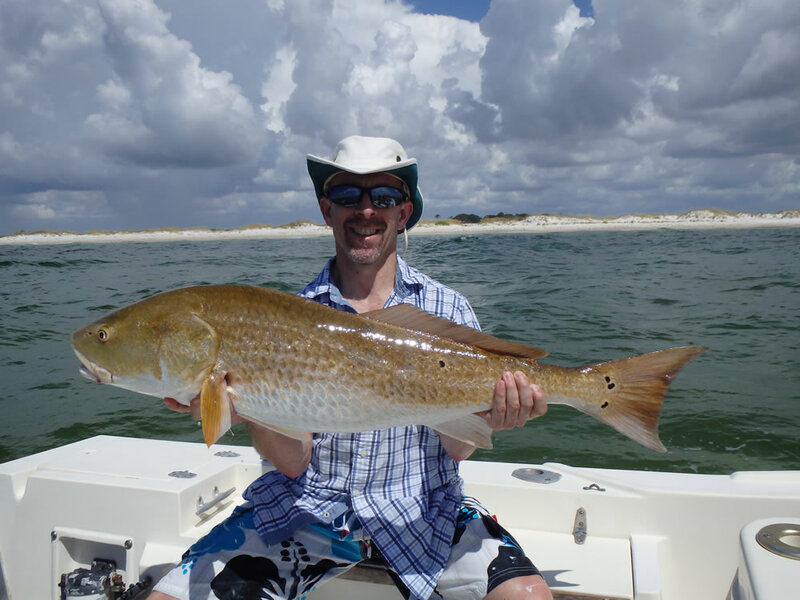 Jeff Nall, Nixa, MO, on August 6 with a lovely redfish on fly landed in shallow water around Pensacola Pass. We were looking for schools of ladyfish and bluefish and were surprised to find a nice bunch of reds milling around in about 6' of water. 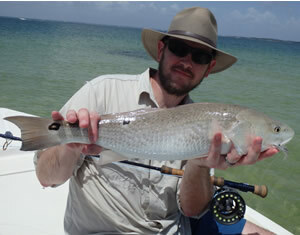 This fish took a tan/white clouser minnow. 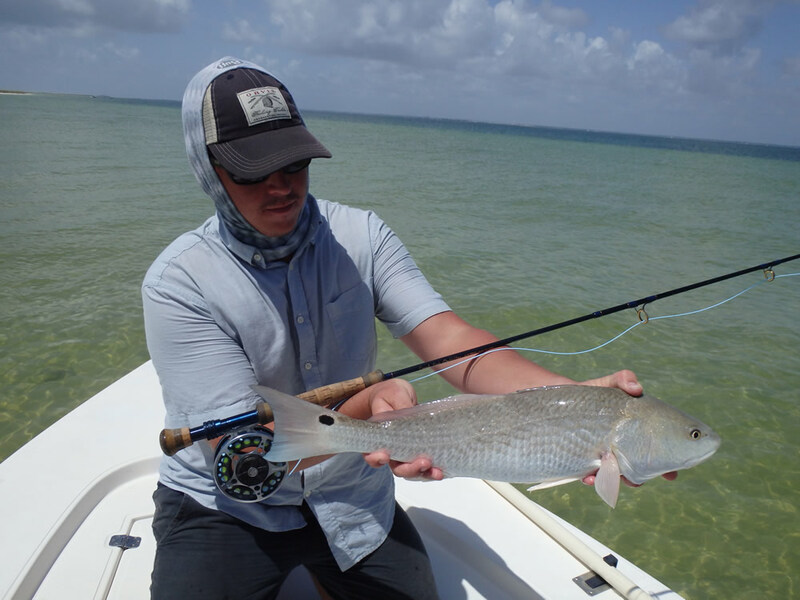 The fish got spooky, and Jeff switched to ultra-light spinning tackle landing numerous fish of this quality before the school disappeared. 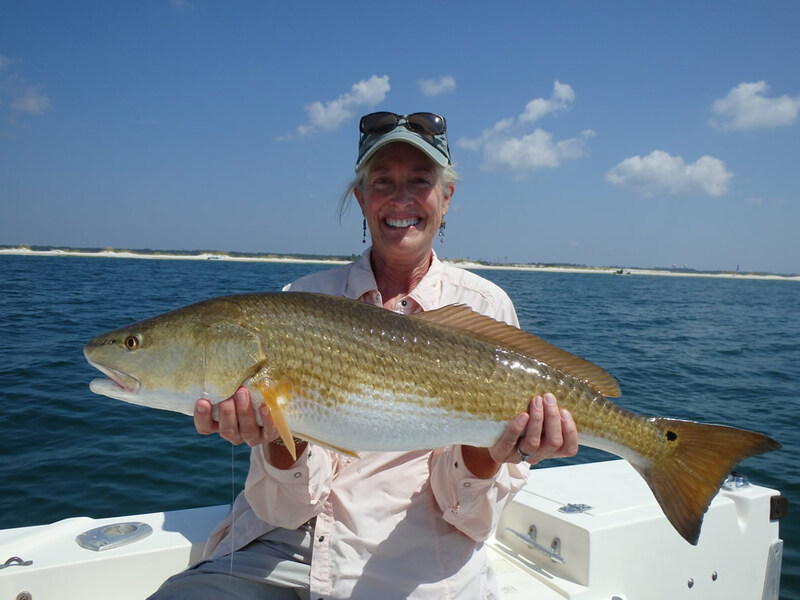 On August 13 the Gulf of Mexico was calm enough for us to look for schools of redfish around Pensacola Pass, and Patsy Vargo, Great Falls, MT, landed this fish and others of similar quality on ultra-light spinning tackle. 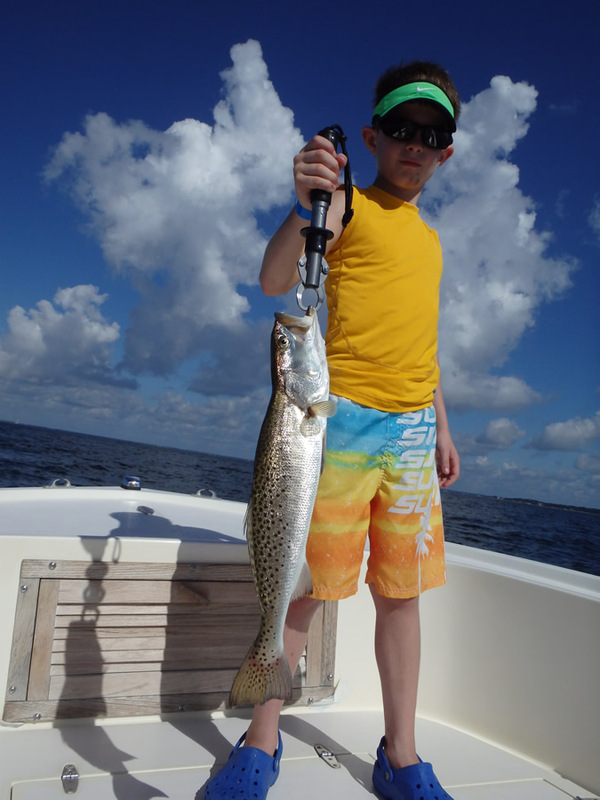 Noah Fox on August 18 with a very respectable trout. 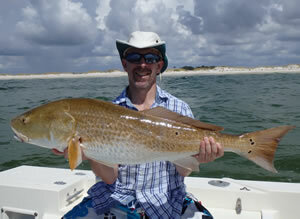 Later in the morning we ventured out into the Gulf and Kevin Fox landed this beauty...his biggest redfish to date. 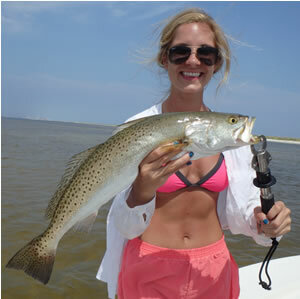 Emily Payne Ferguson fought this big fish like a pro on August 27. 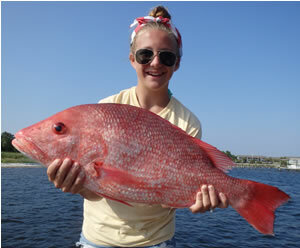 Emily was using ultra-light spinning tackle and a SPRO prime bucktail jig. 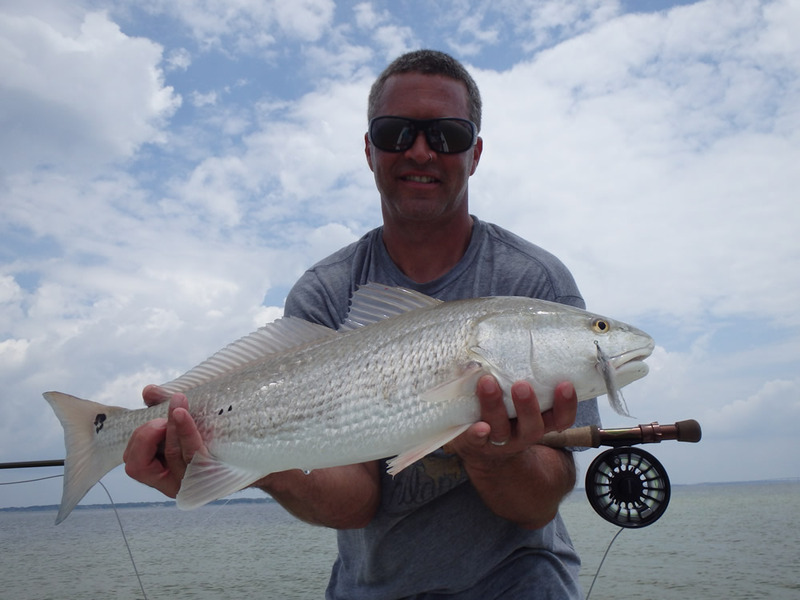 Brothers Paul and Russell Pryor were ready for some redfish sight-fishing on fly August 31. 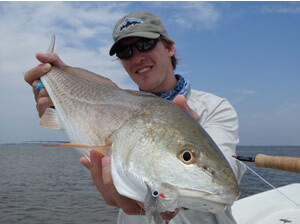 The water on the inside flats was clear and beautiful, and the redfish were willing to participate. 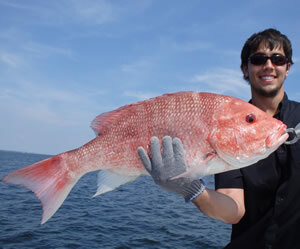 Here's Paul with the first fish landed and released. 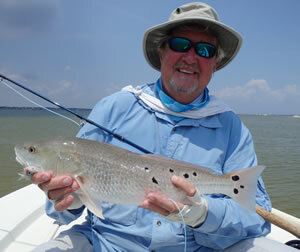 Russell Pryor with his first redfish on fly. 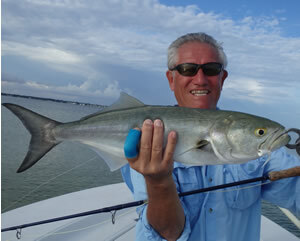 Double click for a good look at the fly...an EP gray/white baitfish. 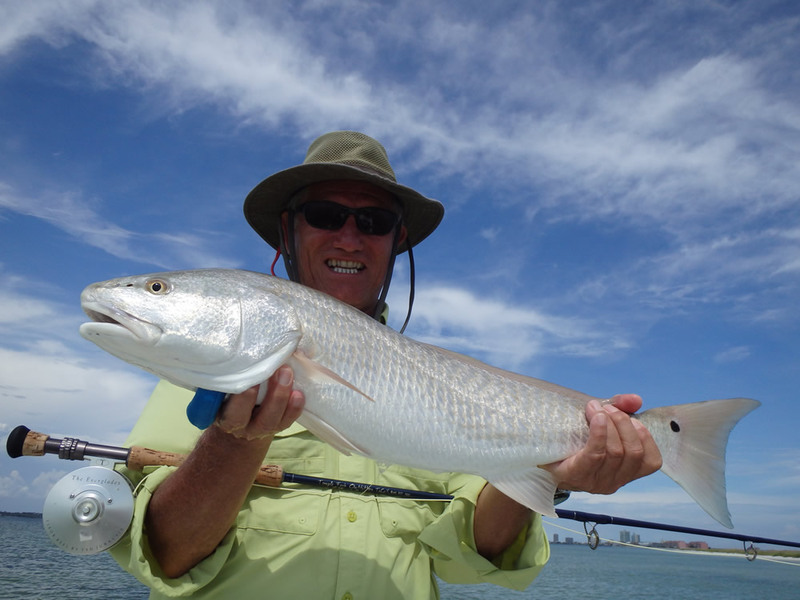 Don Joyner was back September 1 with brother Butch, but the Gulf was too rough to hunt for the schools of redfish. 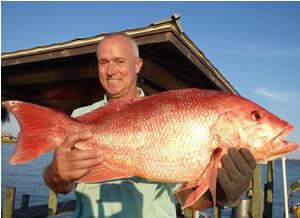 So we stayed in the bay where Don landed and released this monster red snapper. 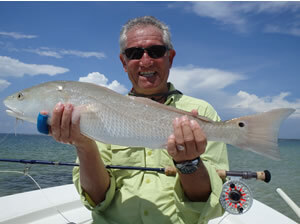 Mike Youkee arrived from London on Sept 1 for four days of fly-fishing en route to Tahiti. 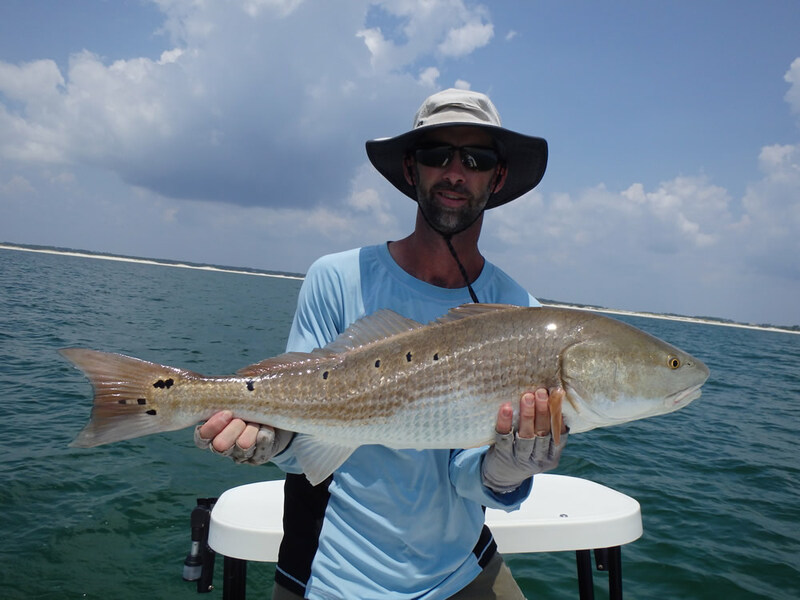 His first day Sept 2 was a solid day on the flats. 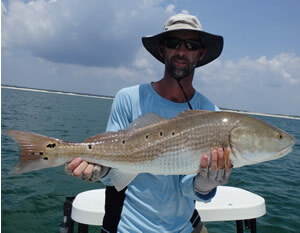 We had good poling conditions with light winds and clear water. 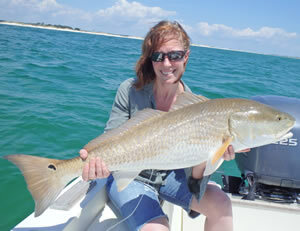 As always, the fishing was "technical"...wary fish, accurate casting required. Here's Mike with his first redfish of the day caught on the EP baitfish pattern and released. 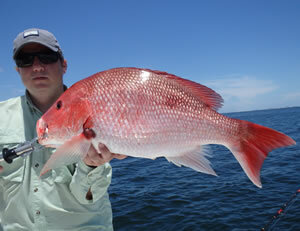 The following day turned out to be one of our all-time best days on the flats. 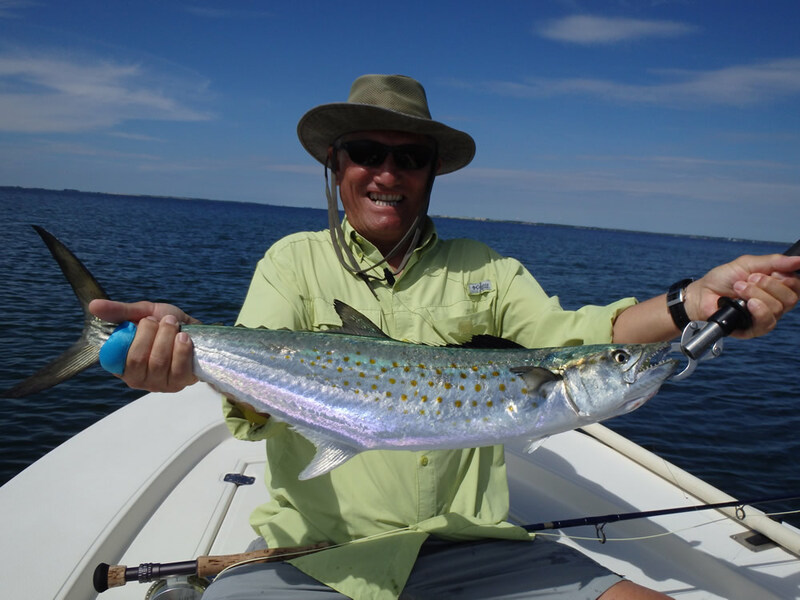 Mike started it off by landing this 5# Spanish mackerel on a tan/white clouser minnow. 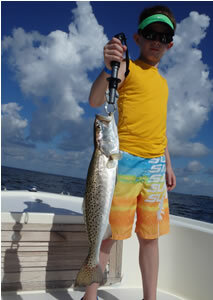 and his fourth... All they wanted was the EP baitfish. It was almost too easy. 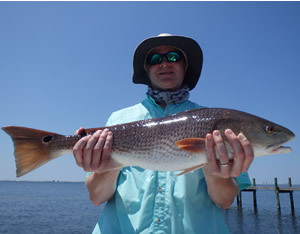 Finally a day of "payback" for all those days when the redfish were so darn picky and nervous! 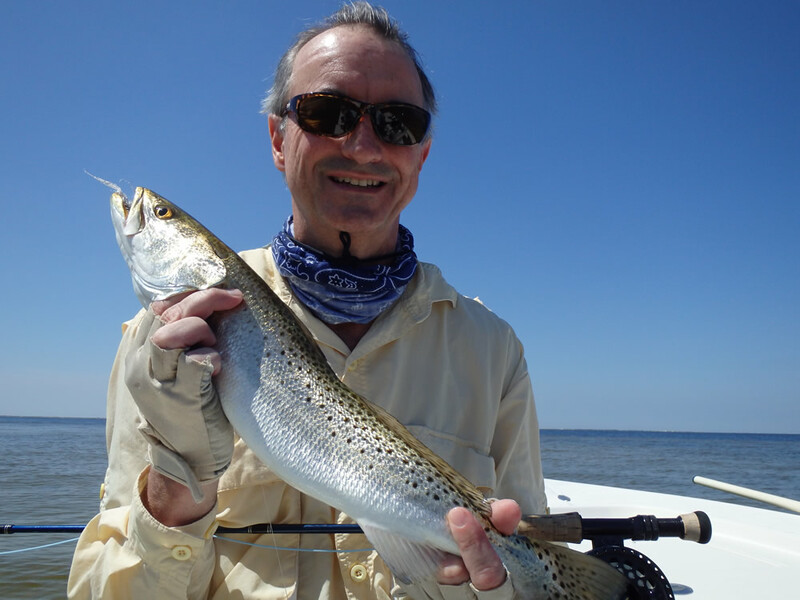 The most spectacular fish that day was the all-time boat record speckled trout on fly. It was mid-afternoon, and we were poling into the outgoing current with the sun at our backs. 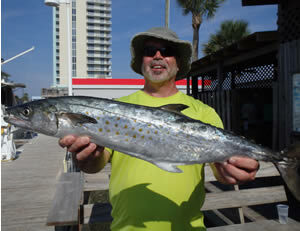 250-300' down the beach, we spotted a big fish just a few feet from shore. 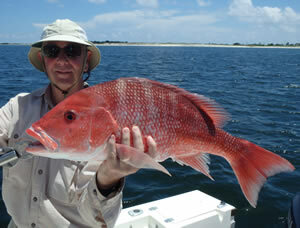 The fish was darkish-brown and appeared to be moving in our direction. As we got a little closer we could see it was actually two fish...a huge one and a big one. 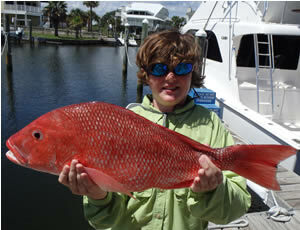 Because of their size we thought they were redfish, but the dark-brownish color made us think "trout". 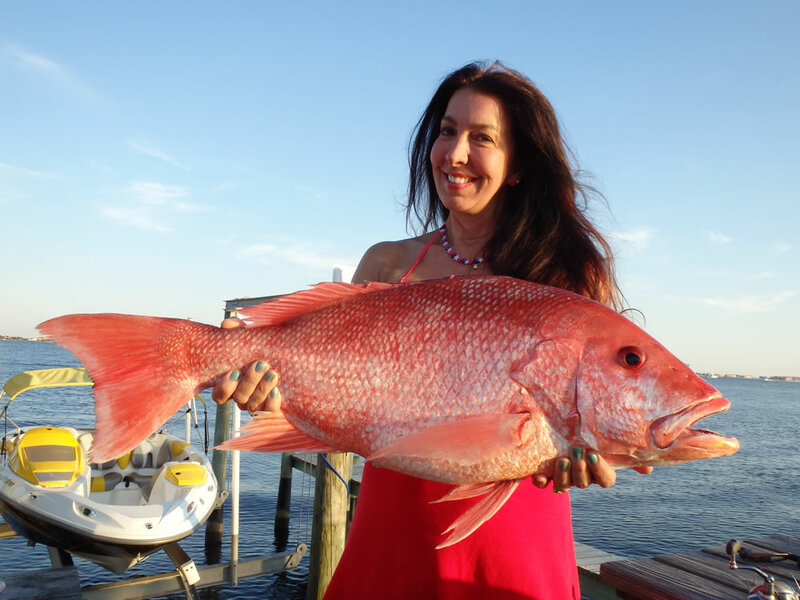 When we had closed to a couple hundred feet from the fish we moved out 40' from shore, so our shadow from the setting sun wouldn't spook them. 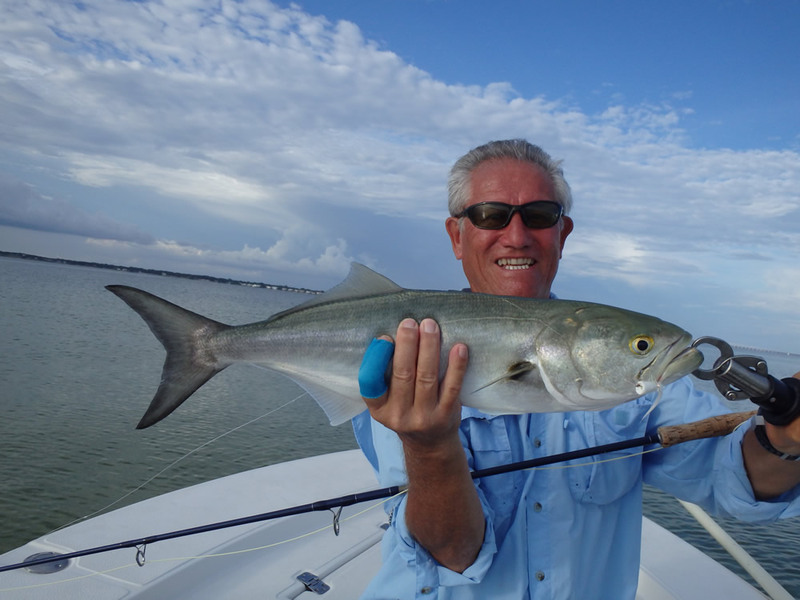 It was a thrill planning the strategy from our point of ambush as the two fish drifted slowly with the current in our direction. 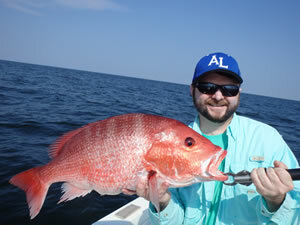 The fish were five feet from shore and a hundred feet away when Mike made the cast. 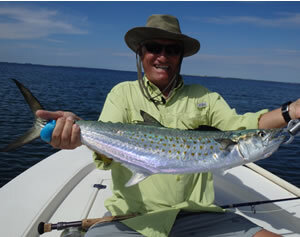 The fly landed undetected about 20' short and left of the fish and sank to the bottom. 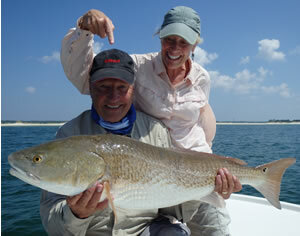 The energy on the boat was intense as we both froze and watched our prey move into the trap. 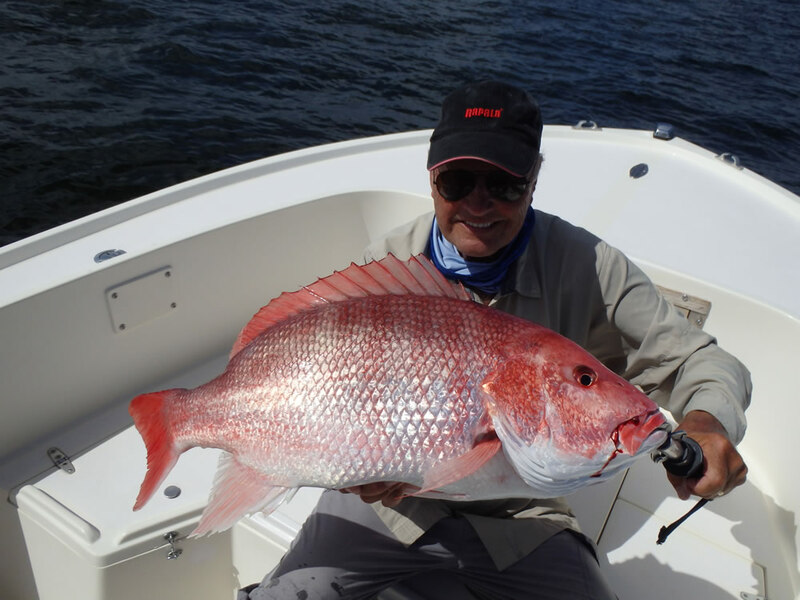 There was additional drama because the outgoing current was slowly drifting the fly toward the boat, and a large belly was forming in the floating line. 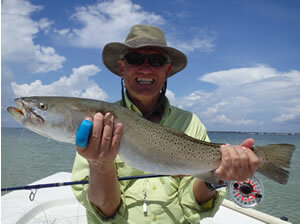 But the drama ended when the trout closed to about ten feet from the fly, and Mike gave it a long smooth strip. 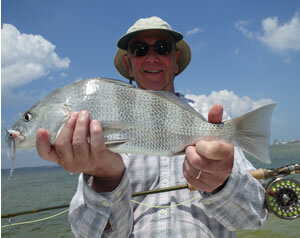 The larger fish saw the fly move and simply swam over and ate it! 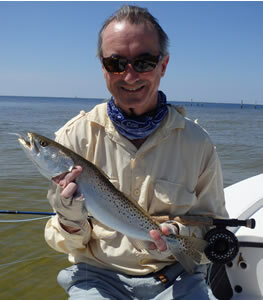 The fish bolted and hit the surface as big trout will do, but Mike had no trouble bringing it to the boat. 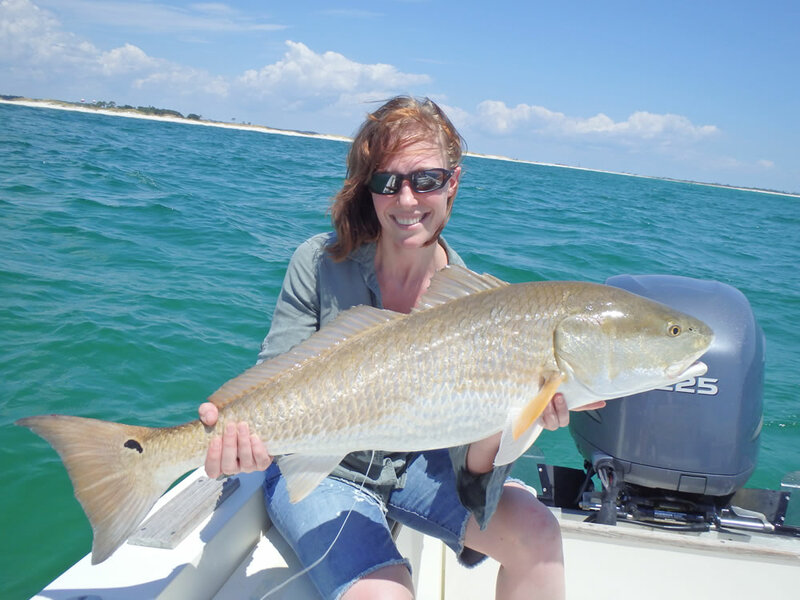 A wet neoprene net gently brought the fish into the boat where we weighed her in the net, removed the barbless hook, took the photo, and released her unharmed and full of eggs. 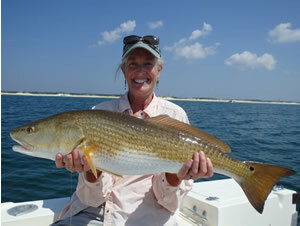 What a beautiful fish...7 pounds...the new all-time boat record! Double click for a full-screen view of this magnificient trout. 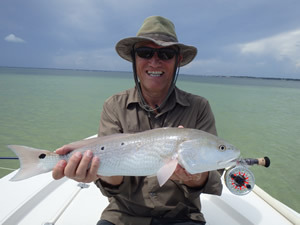 The next day we were shocked back into reality as the redfish ran from every fly Mike put in front of them, and there were no trout to be found. 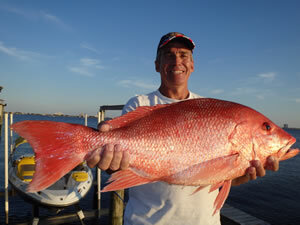 The word "was out", and the fish avoided our offerings like the plague. 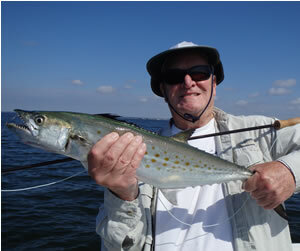 We did find some nice bluefish, and Mike nailed this one on a popper. 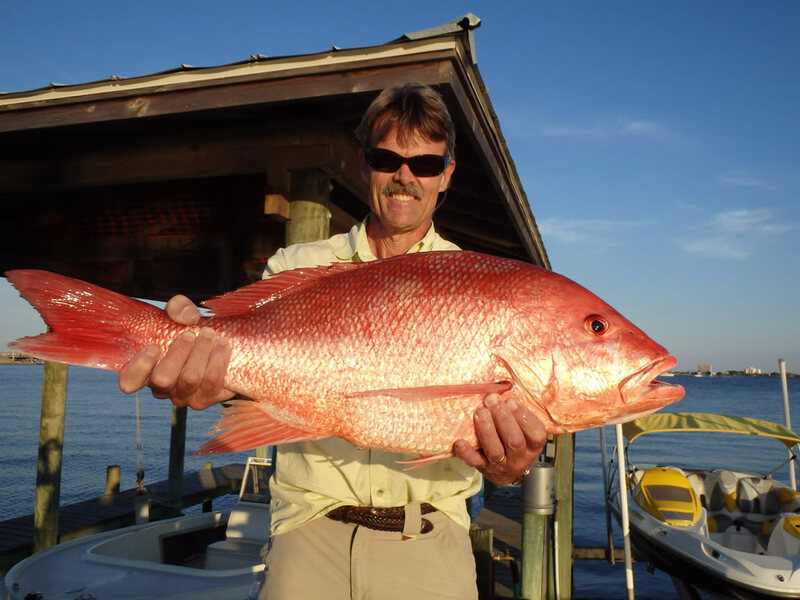 The following two days we fished in howling winds thinking back on the surreal day of fishing just a couple days before... And then Mike was off for Tahiti.